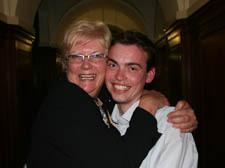 New councillor Matt Sanders get a congratulatory hug from Jill Fraser, his new Lib Dem colleague in the Haverstock ward. THE Liberal Democrats were celebrating into the early hours today (Friday) after claiming victory in the Haverstock by-election. fought campaign, he seemed lost for words as the results were announced at the Town Hall. The 24-year-old said: "I'd just like to say thanks. Thanks to the people of Haverstock, to the voters and the party." people of Haverstock. It is a great place, I've enjoyed campaigning there and there are some fantastic people living there. What I'm worried about is that this result shows there is a two tier Camden developing where the people that need the most help and assistance are finding it hard to be represented on the council." In the race for third, the Greens ousted the Conservatives. The by-election was called after Labour alderman Roy Shaw was forced to step down from the council after 51 years due to ill-health. The ward is now represented by two Lib Dems, Mr Sanders and Jill Fraser, and one Labour member, Syed Hoque. I would like to congratulate Mr. Matt for succeeded in Haverstock by election but LIB Dems must understanding our youth generation and helping them when they are still in early school years. They need extra curriculum support and see the need for a huge culture change as society has become more displaced in terms of family values general moral and social value etiquette has been taken over by the criminally minded yob culture. Its seems to me that many youths have little parental oversight and are too easily influenced by gang culture and glamorized violence in fashionable culture; that a growing number of offenders appear to be younger, and their crimes more violent, and the laws in must be strengthen if any, tough penalties on juvenile offenders and humiliation attached to it . LIB Dems must bring their attention that disadvantage groups have no voices within local and regional authority and this is clearly reflecting in our youth in main stream society from cross cultures. Mr. Matt should win heart and mind our disadvantages youth groups in order not to radicalism by criminally gangster and extremist this will be long term strategy to improve quality, decent homes for all society and fight inequality within Camden Borough. LIB Dems must invest youth project and open youth center within Malden Road or Haverstock make real difference within Haverstock area no need empty promises. LIB Dems Must listen, support small business within local and regional and review how parking enforcement affecting local business within Camden borough in term of revenue. Lib Dem also need to create an agenda policy implemented in restricting the very ethos of societies value pinpointing – family values the value of education re-urban development and regeneration better facilities for overall emphasis on communities – getting rid of pocket minority organization and funding keying one branch network creating an umbrella where there is interaction through out all levels.